The Club at ArrowCreek cell phone tower, once operational, will contribute revenue to the Non-Residential area (golf course) only. Yes, we local ArrowCreek owners will all benefit by having greater reception in ArrowCreek. As for the ‘views’ or interruption thereof, that’s purely up to the individual property owners to protest at the county level meetings. Some owners received a postcard in the mail from Washoe County advising of the application. Attached, is the application from the county website. There are maps and photos in the application. Tentative Hearing Date: June 2, 2016 @ The Board of Adjustment. This ‘may’ be a topic at the next ACHOA Board meeting, however, the HOA is specifically prohibited from representing the lot or resident owners at any hearing according to our ArrowCreek Articles of Incorporation. So it will be up to individual owners to go to the county meetings and lodge any protests. This entry was posted in ACHOA, ACHOA BOD, ArrowCreek, ArrowCreek 411, ArrowCreek HOA, ArrowCreek411, Cell Tower, The Club at ArrowCreek and tagged ACHOA, ACHOA Board, ACHOA BOD, ArrowCreek, ArrowCreek 411, ArrowCreek Cell Tower, ArrowCreek411, Cell Tower Pine Tree, Non-Residential Area, Non-Residential Property, TCAAC, TCAC, The Club at ArrowCreek. Bookmark the permalink. 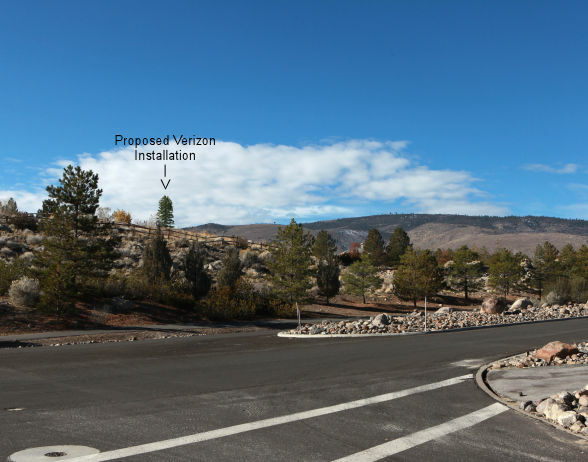 Yes, a cell tower on the Mt. Rose fan, which is where we all live, would be greatly appreciated. However, our current CC&Rs do not account for ANY Non-residential area owner activities beyond operation and maintenance of the golf course. As a consequence, the owners of ‘The Club’ only pay the equivalent of two lots per month for road, security and administrative maintenance. Without a change to the formula, which takes a 50+1% vote, or an offer of compensation to the ACHOA, we will ALL be picking up additional road usage costs for installation and maintenance of this tower.